The Ranger Pro 8x42 is especially suited for hunting until twilight. This model sets new standards in it class. With outstanding optics with a wide field of view, ruggedness and comfort, these roof-prism binoculars are for the professional huntsman. This compact and lightweight hunting binocular offers a unique close-up range is incredibly robust, thanks to a housing made of extremely tough plastic, that was originally designed for space travel. Fast and more accurate identification of game hiding in its natural environment is guaranteed by our High-Contrast Optics. The good depth of focus and improved colour contrast offered by the Ranger Pro series has been achieved by the use of an eco-glass free of heavy metals. The higher light refraction ensures better reflection in the prism, so delivering above-average image quality. The tried and tested silver surface refinement of the phase-corrected roof prisms results in high-contrast images with excellent colour reproduction. The optical system is thus designed to deliver especially high contrast values for night vision to make targeting game easier in the dark. The entire series of Ranger Pro models has been designed using a new, fibre-glass reinforced high-performance plastic material. This offers maximum resistance to mechanical stresses in comparison with commercially available synthetics, so ensuring that the optics of the Ranger Pro binoculars are especially well protected. An unprecedented level of precision for optical adjustment has also been achieved here. The innovative high-tech material used for the housing offers much greater rigidity, making it particularly resistant to outside influences such as impacts or chemicals. When combined with the Nitrogen Pressure System and water pressure proofing up to 3 metres, you can rely on your Ranger Pro model being especially durable and requiring low maintenance. 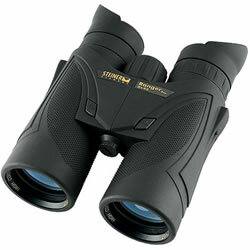 A secure grip and a non-slip surface are essential features if binoculars are to be comfortable while out hunting. Our new NBR rubber armouring featuring a patterned, non slip surface is resistant to oil, acid or any weather conditions so you wont ever lose your grip. The rubber armouring also ensures that these binoculars can be handled without emitting any noise. Even when you are on long trips, the comfortable thumb grips prevent you from feeling tired whatever the situation. With the Ranger Pro youll always have a firm grip on things whether it is hot, cold or wet outside. Even if you wear glasses, the Twist-up eyecups fitted to the Ranger Pro series offer all hunters convenient adjustment in three positions. These eyecups are made of soft silicon that is kind to the skin. Their ergonomic design offers protection from irritating incidental light from the side. Fast, reliable focusing even if you are wearing thick gloves? No problem with the Ranger Pro extra-large focusing ring! Even in cold weather you will be able to focus quickly and reliably. The look of this ring blends in perfectly with the up-to-date design of the Ranger Pro series, so combining functionality with modern styling. You will enjoy a superb field of view thanks to the sophisticated optical design of the Ranger Pro series. The Ranger Pro models offer excellent results when compared with competitive products within the same class. This means you will have a clear view of everything when out hunting. Fogging-up or the formation of condensation inside the binoculars are completely ruled out by this high-tech solution. Even temperature fluctuations over the entire temperature range will not affect your binoculars. Our valve technology allows them to be serviced at any time even after many years. Your Ranger Pro will be ready for use at any moment, no matter how bad the weather. STEINERs clever ClicLoc Belt Attachment makes sure your binoculars are always firmly secured, yet can be easily detached and reattached with a single movement in no time. The standard accessories supplied with the Ranger Pro models include a case, lens covers (which are inserted under the objectives so preventing them from getting lost), a neoprene rain hood as well as a connection for a tripod. These accessories are rounded off by a padded, non-slip neoprene carrying strap that is kind to the skin. Objective diameter 42 mm  Magnification 8 x  Weight 790 g  Width 125 mm  Height 148 mm  Depth 65 mm  Exit Pupil 5.3 mm  Luminosity 28  Twilight Factor 18.3  Field of view / 1000 m 122 m  Focussing System Fast-Close-Focus  Close Focus Range 1.9 m  High-Performance-Optics High-Contrast-Optics  Water proof Water pressure proof up to 3 m  Nitrogen-Pressure-Filling Via 2-way-valve-technology  Temperature Range -20 to +80°C  Eyecups Ergonomic twist-up eyecups  Rubber Armouring NBR-Longlife  Carrying Strap Neopren  Strap Attachment ClicLoc  Objective Cover Yes  Bag yes  Warranty 10 years.